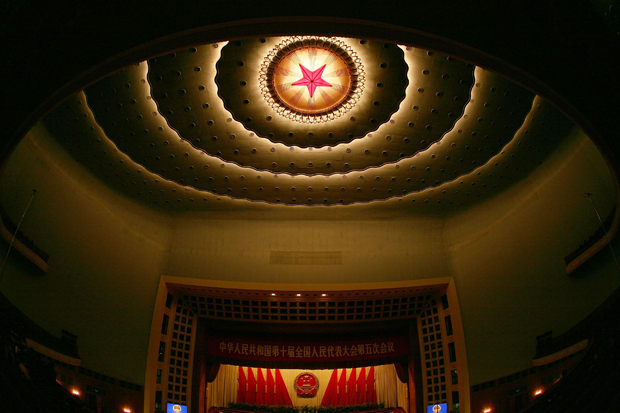 Inside the Great Hall of the People during a closing session of the National People’s Congress, March 2007 in Beijing. How Much Is a Hardline Party Directive Shaping China’s Current Political Climate? This weekend, China’s leaders gather in Beijing for meetings widely expected to determine the shape of China’s economy, as well as the nation’s progress, over the next decade. What exactly the outcome of this Third Plenum of the Eighteenth Party Congress of the Chinese Communist Party will be remains shrouded in no small measure of secrecy, like most matters of high politics in China. President Xi Jinping has signaled that a significant new wave of economic liberalization may be in the works. But in the realm of political reform, Xi also has signaled a deep reluctance. In fact, many of the actions taken and techniques used under his year of leadership suggest a return to ideas and tactics that hark back to the days of Mao Zedong. What suggests the significance of Document 9 is the fact that a worrisomely harsh crackdown against human rights lawyers, media outlets, academics, and other such independent thinkers has followed. But, whether Document 9 is the expression of one faction or that of the central Chinese leadership itself is still uncertain. Mingjing Magazine, a U.S.-based Chinese-language magazine, obtained and published the full text of the document in September 2013 in print. We are confident it is authentic and translate and re-publish it here with Mingjing’s permission. To skip the communiqué’s wordy preamble and go straight to its key sections click here. Provinces, autonomous regions, municipalities directly under the Party committee, Central ministries and state organs, Party ministries, People’s Liberation Army headquarters, major Party committees, and Party leadership groups of civilian organizations: This notice “A Communiqué on the Current State of the Ideological Sphere” has been approved by the central leadership, and is herewith distributed to you. Please thoroughly implement its suggestions. Since the Party’s Eighteenth National Congress, under General Secretary Xi Jinping’s strong central leadership, the nation triumphantly convened the National People’s Congress and the Chinese People’s Political Consultative Conference, the Party’s and nation’s various undertakings have made a good start, and the general mood of the Party and Government has been constantly improving. Cohesion among our nation’s people has become stronger and our confidence in our path, our theory, and our system has become more resolute. Mainstream ideology is becoming healthier and more vigorous. The spirit of the Party’s Eighteenth National Congress and General Secretary Xi Jinping’s series of important speeches have unified the thought of the entire Party, the entire country, and the entire people enormously. The ideological foundation of our united struggle is unceasingly solidifying. The new session of the central leadership group has: put forth a series of new principles for conduct in political administration, furnished an interpretation of the Chinese dream of the great rejuvenation of the Chinese nation, improved our work-style, maintained close ties with the masses, rigorously enforced diligence and thrift, opposed extravagance and waste, increased vigor in the fight against corruption, and won the widespread endorsement of cadres and the masses. We persist in upholding scientific development as the main theme, accelerating economic transformation as the main thread, and increasing the quality and efficiency of the economy as the core. The outlook for our nation’s economic development continues to be favorable, and the people’s faith in China’s economic prospects has risen. In an effort to improve the people’s livelihood, we are putting forth new measures to benefit the people so they may look forward to a better future: disseminating thought on the cultural front as the most important political task; studying, implementing, and advancing the spirit of the Eighteenth Party Congress; rapidly arousing mass fervor, proclaiming that socialism with Chinese characteristics and the Chinese dream are the main theme of our age; expanding and strengthening positive propaganda; strengthening guidance on deep-seated problems; strengthening the management of ideological fronts; promoting unification of thought; concentrating our strength and implementing the development of a positive atmosphere and providing spiritual strength to the party and nation. 1. Promoting Western Constitutional Democracy: An attempt to undermine the current leadership and the socialism with Chinese characteristics system of governance. Western Constitutional Democracy has distinct political properties and aims. Among these are the separation of powers, the multi-party system, general elections, independent judiciaries, nationalized armies, and other characteristics. These are the capitalist class’ concepts of a nation, political model, and system design. The concept of constitutional democracy originated a long time ago, and recently the idea has been hyped ever more frequently. This is mainly expressed the following ways: In commemorating the thirtieth anniversary of the enactment of the [Chinese] Constitution, [some people] hold up the banners of “defending the constitution” and “rule of law.” They attack the Party’s leaders for placing themselves above the constitution, saying China “has a constitution but no constitutional government.” Some people still use the phrase “constitutional dream” to distort the Chinese dream of the great rejuvenation of the Chinese nation, saying things like “constitutional democracy is the only way out” and “China should catch up with the rest of the world’s trend toward constitutional governance.” The point of publicly proclaiming Western constitutional democracy’s key points is to oppose the party’s leadership and implementation of its constitution and laws. Their goal is to use Western constitutional democracy to undermine the Party’s leadership, abolish the People’s Democracy, negate our country’s constitution as well as our established system and principles, and bring about a change of allegiance by bringing Western political systems to China. 2. Promoting “universal values” in an attempt to weaken the theoretical foundations of the Party’s leadership. The goal of espousing “universal values” is to claim that the West’s value system defies time and space, transcends nation and class, and applies to all humanity. Given Western nations’ long-term dominance in the realms of economics, military affairs, science, and technology, these arguments can be confusing and deceptive. The goal [of such slogans] is to obscure the essential differences between the West’s value system and the value system we advocate, ultimately using the West’s value systems to supplant the core values of Socialism. 3. Promoting civil society in an attempt to dismantle the ruling party’s social foundation. Civil society is a socio-political theory that originated in the West. It holds that in the social sphere, individual rights are paramount and ought to be immune to obstruction by the state. For the past few years, the idea of civil society has been adopted by Western anti-China forces and used as a political tool. Additionally, some people with ulterior motives within China have begun to promote these ideas. Promoting civil society and Western-style theories of governance, they claim that building a civil society in China is a precondition for the protection of individual rights and forms the basis for the realization of constitutional democracy. Viewing civil society as a magic bullet for advancing social management at the local level, they have launched all kinds of so-called citizen’s movements. Advocates of civil society want to squeeze the Party out of leadership of the masses at the local level, even setting the Party against the masses, to the point that their advocacy is becoming a serious form of political opposition. 5. Promoting the West’s idea of journalism, challenging China’s principle that the media and publishing system should be subject to Party discipline. Some people, under the pretext of espousing “freedom of the press,” promote the West’s idea of journalism and undermine our country’s principle that the media should be infused with the spirit of the Party. Defining the media as “society’s public instrument” and as the “Fourth Estate;” attacking the Marxist view of news and promote the “free flow of information on the Internet;” slandering our country’s efforts to improve Internet management by calling them a crackdown on the Internet; claiming that the media is not governed by the rule of law but by the arbitrary will of the leadership; and calling for China to promulgate a Media Law based on Western principles. [Some people] also claim that China restricts freedom of the press and bang on about abolishing propaganda departments. The ultimate goal of advocating the West’s view of the media is to hawk the principle of abstract and absolute freedom of press, oppose the Party’s leadership in the media, and gouge an opening through which to infiltrate our ideology. 6. Promoting historical nihilism, trying to undermine the history of the CCP and of New China. The goal of historical nihilism, in the guise of “reassessing history,” is to distort Party history and the history of New China. Rejecting the revolution; claiming that the revolution led by the Chinese Communist Party resulted only in destruction; denying the historical inevitability in China’s choice of the Socialist road, calling it the wrong path, and the Party’s and new China’s history a “continuous series of mistakes”; rejecting the accepted conclusions on historical events and figures, disparaging our Revolutionary precursors, and vilifying the Party’s leaders. Recently, some people took advantage of Comrade Mao Zedong’s 120th birthday in order to deny the scientific and guiding value of Mao Zedong thought. Some people try to cleave apart the period that preceded Reform and Opening from the period that followed, or even to set these two periods in opposition to one another. By rejecting CCP history and the history of New China, historical nihilism seeks to fundamentally undermine the CCP’s historical purpose, which is tantamount to denying the legitimacy of the CCP’s long-term political dominance. 7. Questioning Reform and Opening and the socialist nature of socialism with Chinese characteristics. For the past several years, the discussion of reform has been unceasing, with all kinds of voices joining one after another. Some views clearly deviate from socialism with Chinese characteristics. Some blame the contradictions and problems of development on Reform and Opening. They say “Reform and opening up has gone too far” and that “we have deviated from our Socialist orientation.” They question whether or not what China is doing now still truly is Socialism, or they just call it “Capitalist Socialism,” “State Capitalism,” or “New Bureaucratic Capitalism.” Others say “reform is still distant and hasn’t be realized” or that “reform of the political system lags behind and obstructs reform of the economy.” They bang on about how we should use Western standards to achieve so-called “thorough reform.” Essentially, they oppose the general and specific policies emanating from the road taken at the Third Plenum of the Eleventh Party Congress and they oppose socialism with Chinese characteristics. These mistaken views and ideas exist in great numbers in overseas media and reactionary publications. They penetrate China through the Internet and underground channels and they are disseminated on domestic Internet forums, blogs, and microblogs, They also appear in public lectures, seminars, university classrooms, class discussion forums, civilian study groups, and individual publications. If we allow any of these ideas to spread, they will disturb people’s existing consensus on important issues like which flag to raise, which road to take, which goals to pursue, etc., and this will disrupt our nation’s stable progress on reform and development. Western anti-China forces and internal “dissidents” are still actively trying to infiltrate China’s ideological sphere and challenge our mainstream ideology. Some of their latest major efforts include: Some people have disseminated open letters and declarations and have organized petition-signings to vocalize requests for political reforms, improvement of human rights, release of “political prisoners,” “reversing the verdict on ‘6/4’[the Tiananmen Massacre],” and other such political demands; they have made a fuss over asset disclosure by officials, fighting corruption with the Internet, media supervision of government, and other sensitive hot-button issues, all of which stoke dissatisfaction with the Party and government. Western embassies, consulates, media operations, and NGOs operating inside China under various covers are spreading Western ideas and values and are cultivating so-called “anti-government forces.” Cooking up anti-government publications overseas. Within China’s borders, some private organizations are creating reactionary underground publications, and still others are filming documentaries on sensitive subject matter, disseminating political rumors, and defaming the party and the national leadership. Those manipulating and hyping the Tibetan self-immolations, manufacturing the violent terrorist attacks in Xinjiang, and using the ethnic and religious issues to divide and break up [the nation]. Accelerating infiltration of the Internet and illegal gatherings within our borders. “Dissidents” and people identified with “rights protection” are active. Some of them are working together with Western anti-China forces, echoing each other and relying on each other’s support. This clearly indicates that the contest between infiltration and anti-infiltration efforts in the ideological sphere is as severe as ever, and so long as we persist in CCP leadership and socialism with Chinese characteristics, the position of Western anti-China forces to pressure for urgent reform won’t change, and they’ll continue to point the spearhead of Westernizing, splitting, and “Color Revolutions” at China. In the face of these threats, we must not let down our guard or decrease our vigilance. Pay Close Attention to Work in the Ideological Sphere. 1. Strengthen leadership in the ideological sphere. Party members and governments of all levels must become fully aware that struggles in the ideological sphere are perpetual, complex, and excruciating; you must strengthen awareness of the current political situation, big picture, responsibility, and risks. Leaders at all levels of government, you must strengthen your sense of responsibility—make work in the ideological sphere a high priority in your daily agenda, routinely analyze and study new developments in the ideological sphere, react swiftly and effectively, and preemptively resolve all problems in the ideological sphere. 2. Guide our party member and leaders to distinguish between true and false theories. Forcefully resist influential and harmful false tides of thoughts, help people distinguish between truth and falsehood, and solidify their understanding. Party members, especially high-level leaders, must become adept at tackling problems from political, big-picture, strategic, and theoretical perspective. They must clearly recognize the essence of false ideas and viewpoints, both their theoretical falsehood and the practical political harm they can cause. We must have a firm approach and clear-cut stance toward major political principles, issues of right and wrong, what to support and what to oppose. We must uphold strict and clear discipline, maintaining a high-level unity with the Party Central Committee under the leadership of General Secretary Xi Jinping in thought, political stance, and action. We must not permit the dissemination of opinions that oppose the Party’s theory or political line, the publication of views contrary to decisions that represent the central leadership’s views, or the spread of political rumors that defame the image of the Party or the nation. 3. Unwavering adherence to the principle of the Party’s control of media. The [principle of the Party’s control of media] stems from our political system and the nature of our media. We must maintain the correct political direction. We must firmly hold fast to the principle of the media’s Party spirit and social responsibility, and that in political matters it must be of one heart and mind with the Party. We must persist in correct guidance of public opinion, insisting that the correct political orientation suffuse every domain and process in political engagement, form, substance, and technology. We must give high priority to building both the leadership and rank and file in the sphere of media work. We need to strengthen education on the Marxist perspective of media to ensure that the media leadership is always firmly controlled by someone who maintains an identical ideology with the Party’s Central Committee, under General Secretary Xi Jinping’s leadership. 4. Conscientiously strengthen management of the ideological battlefield. When facing sensitive events and complex puzzles in the ideological sphere, we should implement the principle that the people in charge assume responsibility and use territorial management. We must reinforce our management of all types and levels of propaganda on the cultural front, perfect and carry out related administrative systems, and allow absolutely no opportunity or outlets for incorrect thinking or viewpoints to spread. Conscientiously implement the “Decision of the Standing Committee of the National People’s Congress on Strengthening Information Protection on Networks,” strengthen guidance of public opinion on the Internet, purify the environment of public opinion on the Internet. Improve and innovate our management strategies and methods to achieve our goals in a legal, scientific, and effective way.